The new Hornady 4DOF ballistics calculator is so precise because it combines what Hornady calls the Four Degrees of Freedom. In other words, it takes into account windage, elevation, range, and angle of attack to generate a drag coefficient. After our 500-yard testing was complete, I told my associates I needed to get the DOPE (data of previous engagement) on my son’s African rifle. This would save a trip back to the range and give him some time behind the gun as payment for the support role he’d been filling. The previous evening we had chronographed the Hornady Precision Hunter ELD-X load for the 6.5 Creedmoor my son would be using. That velocity, along with the bullet and related specifics were entered into Hornady’s 4DOF ballistic calculator, which is available online. I’d printed the results and our goal was to confirm elevation come-ups out to 500 yards. Amazingly, this was done with 5 shots; my son connected center target at 100, 200, 300, 400, and 500 yards. The data generated by the Hornady 4DOF calculator was spot-on. Bat was having fun and shooting well, and since he now had the attention of the visiting editors, I figured, what the heck, he might as well try 700 yards. His first shot at 700 was about 2 inches high so he made a .25-MOA correction and fired again. Center hit! Now he really had their attention. The next farthest target was at what I was told was 1,100 yards, and Bat asked if he could take a poke. I was skeptical and worried he’d blow the impression he’d already made on these experts, but figured the boy deserved a chance. The Hornady 4DOF ballistics calculator data called for a 38.25-MOA adjustment at 1,100 yards. I got on the spotting scope and told him, “Send it.” He did, and he missed high, by what appeared to be several feet. I Instructed Bat to walk the reticle in the Bushnell 2.5-10X Engage riflescope — yes, this was a 10X riflescope — down 1 MOA at a time. At 3 MOA below center, I called the shot just left. (Wind is a terrible thing at 1,100 yards.) My instructions were to keep the same elevation hold but to also hold 2 MOA off the right edge. He pulled the trigger six times and achieved six hits. The onlookers were stunned, I however, was confused. With the 4 DOF calculator from Hornady you can input your data and go to the range with total confidence it will be precise. Of course, remember, garbage in, garbage out. You have to input the right information. How could the Hornady 4DOF ballistics calculator data be so correct out to 700 yards and be off so much at 1,100? A range finder and a return to the Hornady 4DOF ballistics calculator answered the question. Instead of 1,100 yards, the target was at 1,048 yards. Resetting the Hornady 4DOF calculator to display come-ups in increments of 10 yards, it showed the proper correction for that distance to be 35.25 MOA. With our original 38.25-MOA correction we were 3 MOA or about 33 inches high. Had we known the correct range to the target, the 4DOF-generated data would have allowed for an easy first or, since we had a bit of wind, second-round hit. What makes all this possible is the math and mechanics behind the Hornady 4DOF ballistics calculator system. 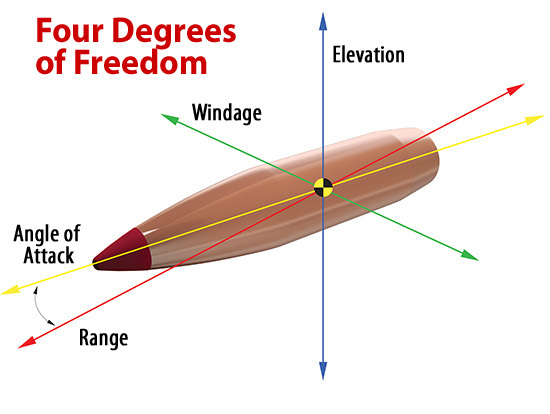 Its four degrees of freedom, taking into account windage, elevation, range, and angle of attack, allow trajectory solutions to be calculated with a drag coefficient instead of a ballistic coefficient (BC). It’s also the first publicly available ballistics calculator capable of determining the accurate vertical shift a bullet experiences as it encounters a crosswind, which is known as aerodynamic jump. By using Doppler radar and actually shooting bullets, Hornady calculates the exact drag curve for every projectile in the 4DOF Bullet Library. (Currently there are more than 100 projectiles from Hornady, Lapua, Berger and Sierra.) BC can change as velocity changes, a drag curve doesn’t. Explained simply, instead of using BC, which gives you a snapshot of a bullet at various distances; Hornady has created a video of the bullet’s flight. This allows the 4DOF calculator to predict drop with perfection at any distance, every time. The takeaway from all this — the one that’ll matter to you and your ammo — is that the Hornady 4DOF ballistic calculator is extraordinarily precise. Taking data this exact to the field on a first try is as rare as 17-year-old boys who can hit at 1,100 yards, six times in a row. Previous PostSKILLS: Trigger Jerk: How to Solve ItNext PostHunting Non-Native Species In America: Is it For You? So Hornady told half the market place to pound sand. Nope, I just forgot to add the link. Quick Google search brought up the 4Dof calculator in the Hornady app. I’ve added the link to the bottom of the article.